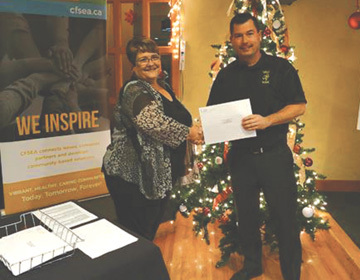 PUTTING KIDS THROUGH SPORT: Connelly Sherwick representing ÒKidSport Òis presented a cheque for $12,500 at the Annual Community Foundation grant presentations. The Community Foundations of South Eastern Alberta (CFSA) held their annual Chair’s Reception at the Connaught Golf Club on Nov. 29. There was near $70,000 in grants doled out to various southeastern Alberta organizations. KidSport is an Alberta wide volunteer organization with chapters in various towns and cities throughout the province. It is primary involved with assisting those families in need having children that are struggling to find the funds necessary to participate in organized sports. The local chapter raises over $70,000 a year and through a board of Directors disburses up to $300.00 per child to assist in registration costs and equipment needed for the young people to participate in the sport of their choice. Connelly Sherwick has been involved with the Chapter for 15 years and is the volunteer chairman and executive director. “We helped over 300 children last year,” he said. KidSport is available to help anyone that meets the requirements, in south east Alberta, including Medicine Hat, Redcliff, Irvine, Foremost and outlying areas. “We don’t receive any government help, individuals and corporations sponsor us,” said Sherwick. “We are on a fundraising treadmill that never stops. During the energy downturn donations dried up and the demand was greater than ever, so we actually had to curtail our funding and reduce the amount per child to $200.00, at that time we reorganized our fundraising efforts and our fundraising committee got us replenished back up to point that we have some funds ahead going forward”. Redcliff, and the surrounding area are the beneficiaries of this wonderful group of hardworking people that are dedicated to finding ways to help those struggling to provide the extras for kids. Often organized sports get cut from the family budget when times are difficult, so it is nice to know that KidSport is there to help.